Alzheimer's Care Why are the Little Things Bothering You? 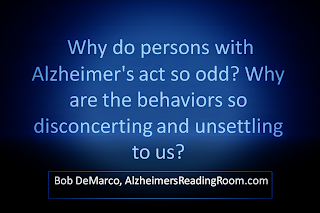 Why do persons with Alzheimer's act so odd? Why are the behaviors so disconcerting and unsettling to us? Previously I wrote, Dotty Loves Flowers. The comments made me laugh, they made me smile, they made me feel good. They also reminded me that we all have a lot in common; and that, we are not alone. Within her comment Jocelyn wrote, "Why is it that it is usually the little things that are so annoying?" This reminded me how fortunate I was back in the beginning. Just the right people listened to me vent, smiled as they listened, and shared their own similar experience with me. This is when I learned, for real, that I was not alone. This simple understanding lifted a huge burden off my back. Learning, for real, that I was not alone empowered me. But as I read Jocelyn's words, "Why is it that it is usually the little things that are so annoying? ", I couldn't help but think, what would have happened way back near the beginning if someone had asked me that question? My guess is that I would have shortly thereafter stopped letting the little things bother me. After some thought, I think that addressing and answering the question, "Why am I allowing the little things to bother me", could provide a short cut to Alzheimer's World. As many of you know, Alzheimer's World is only one giant step to the left. Once you make the step, you understand you are in a new and different place where the bizarre, the different, and the new and disconcerting behaviors are "normal". My belief, the odd behaviors, the sudden change of what we had come to expect from a person, to a new and different set of behaviors that we could never have expected, are easier to understand and accept from an Alzheimer's World perspective. This happens because we evaluate those behaviors against real world behaviors. What we have come to expect over the course of our lives. When we do this we feel angry, sad, disconcerted, and often confused. However, once we begin to accept and understand that these new, unexpected behaviors are normal for a person living with Alzheimer's we can make it to the new world, Alzheimer's World. What harm was Dotty doing when she hacked away at the flowers? What harm when she incessantly counts her change, stacks it up, moves it around, and puts giant amounts of change in both of her pants pockets? What harm. In our case, most, not all, of the crazy stuff Dotty does makes her happy. So guess what? When I go over into her world, Alzheimer's World, and accept what she is doing as the "new normal", I feel happy. Very happy. Why was I so bent of shape for so long? Why didn't someone I was venting too ask me, Why are you allowing these little things, the little behaviors, to drive you nuts? From now on, I am going to ask any dementia caregiver I meet who is venting, Why? Why are you allowing these behaviors to drive you crazy? These behaviors emanate from Alzheimer's World. Why not accept this new and different world? Why do behaviors that are happening right now, all over the world, drive us crazy?